The origins of this church lie in ministry to the poor of Ladywood around the Coplow Street area where there was an Anglican mission serving a district of back-to-back houses. 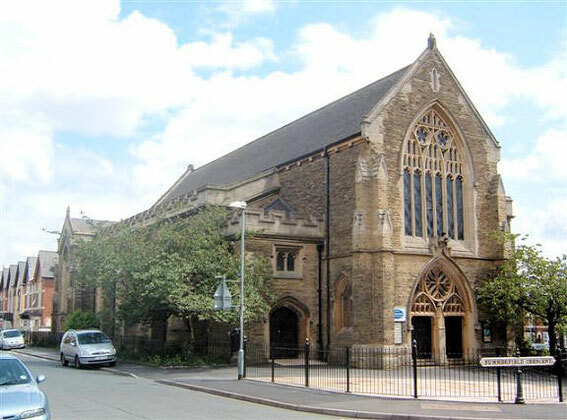 However, Christ Church was built in 1885 in open country beyond the urban spread, in an area that was to become more up-market district of middle-class semi-detached houses. The church website - http://www.christchurchsummerfield.org/about/early-history/. 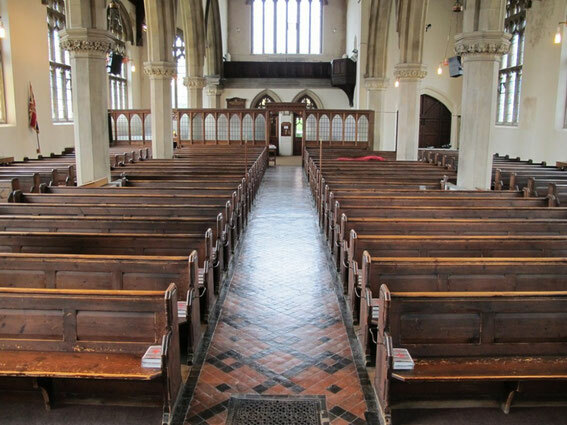 See also A Church Near You - https://www.achurchnearyou.com/summerfield-christ-church/. For 19th-century Ordnance Survey maps of Birmingham go to British History Online. See http://www.british-history.ac.uk/mapsheet.aspx?compid=55193&sheetid=10089&ox=2293&oy=1801&zm=1&czm=1&x=350&y=217. Christ Church was built as a memorial to Rev George Lea, the perpetual curate of St George's, Edgbaston 1864-83. It is a stone building designed in Perpendicular style, the last such in Birmingham, by the renowned Birmingham architect J. A. Chatwin. It has an apsidal chancel, nave, aisles and transepts. It was originally intended to have a tower and spire on the site of the north porch but this was not to be. The church was consecrated in 1885 with a parish being assigned from St. John's, Ladywood. The origins of the church lie in the work of Rev George Sherbrooke-Walker, a young curate sent in 1879 by Rev J L Porter, vicar of St John's Ladywood to work among the poor of the district with a base at Coplow Street Mission Hall. Not only was he successful in drawing people to the mission, but he also managed to persuade local industrialists and business people to fund the building a church on land that had already been given by Henry Weiss of Summerfield House, a rich Birmingham merchant of Swiss origin. At this time a a committee was formed to honour Rev George Lea, who had just retired as the perpetual curate of St George's, Edgbaston. Sherbrooke-Walker persuaded the committee that Weiss's land should be site for a memorial church and that it should be named after Christ Church, New Street where George Lea had worked for many years before moving to Edgbaston. Sherbrooke-Walke raised £10,000 by public subscription, probably £1 million in modern terms. Sadly George Lea did not live to see the church built, but his widow laid the foundation stone in November 1883. Historic England website - https://historicengland.org.uk/listing/the-list/list-entry/1076167.